Engage! is heading to the Canadian Rocky Mountains for our 24th event at the acclaimed Fairmont Banff Springs, June 18th – 21st, 2018. Join us as the wedding industry elite gathers for three days of inspiration, education, and celebration in Banff, Alberta. Engage! will be welcoming a diverse collection of speakers, a mix of past favorites and new faces to the Engage! stage. Engage! is designed for committed wedding industry professionals looking for innovative ideas and practical solutions for strategic growth. Engage! is dedicated to gathering the best of the best, and is limited to 350 speakers and attendees. Careful attention is paid to creating an intimate atmosphere that blends structure and downtime, allowing for candid networking in a non-client, non-competitive environment. The open exchange of ideas, information, and strategies for facing the challenges of the luxury wedding industry are a hallmark of the event — often imitated, never repeated. 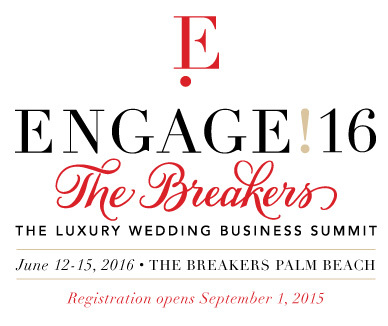 Engage!18 Canada's speaker lineup includes top figures in the luxury wedding and event business. Every speaker has been carefully chosen for the high quality of insights and practical knowledge they provide to our attendees. To see who's speaking this year, click the button below. This was my absolute favorite Engage! So intimate, so special. I made the most amazing connections! Engage! brings together leaders in the luxury wedding industry, from celebrity planners to luxury lifestyle experts to creative entrepreneurs offering unique insights on business strategies and life balance. International media is in regular attendance, offering opportunities for print & digital. Return engagees take special care to welcome first time attendees and friendships are created and strengthened as busy pros take a break from serving others to share their own successes and struggles with like-minded, high-caliber peers from the wedding and events community. Intimate by design, Engage! blends a tailored schedule of curated activities along with creative extras and down time, offering myriad opportunities for natural networking. From formal sessions to creatively themed breaks and explorations into the region, the mood is collaborative, not competitive. Drawing a diverse, well-vetted audience, Engage! has brought together global luxury wedding professionals from across the US and over 50 countries including Australia, Canada, Denmark, Singapore, Brazil, The Netherlands, Egypt, Great Britain, Italy, China, Ireland, Kuwait, Mexico, South Africa, Thailand, Turkey, Dubai, Russia and the many countries of the Caribbean.